Entrepreneur Steve Jobs, co-founder of Apple Computer Inc., died Wednesday. He was 56. Jobs' vision for a "computer for the rest of us" yielded a host of products and services that have revolutionized the tech industry, among numerous others. During his reign at the top of Apple, the company introduced the iPod portable digital audio player in 2001, an online marketplace called the Apple iTunes Store in 2003, the iPhone handset in 2007 and the iPad tablet computer in 2010. 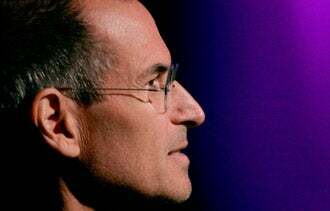 While Jobs struggled with health issues including a pancreatic tumor and a liver transplant, Apple's products continued to resonate with consumers, driving mind-boggling profits for the company. Apple says it has sold more than 300 million iPods, over 100 million iPhones and more than 15 million iPad devices. The company has sold billions of songs from its iTunes Store. Facebook Poll: Which Steve Jobs quote do you most connect with as an entrepreneur? "I'm truly saddened to learn of Steve Jobs' death. Melinda and I extend our sincere condolences to his family and friends, and to everyone Steve has touched through his work. "For those of us lucky enough to get to work with him, it's been an insanely great honor. I will miss Steve immensely." "May Steve rest in peace. My deepest sympathy to his loved ones. No CEO has done more for his customers, employees, and shareholders than Steve. "You changed our lives, Steve, and you showed us that there is a better way. . .we will miss you." "He was a once-in-a-generation mind. His ability to understand and translate pop culture was second to none. He will be missed." "From the earliest days of Google, whenever Larry and I sought inspiration for vision and leadership, we needed to look no farther than Cupertino. Steve, your passion for excellence is felt by anyone who has ever touched an Apple product (including the Macbook I am writing this on right now). And I have witnessed it in person the few times we have met." "By building one of the planet's most successful companies from his garage, he exemplified the spirit of American ingenuity. By making computers personal and putting the Internet in our pockets, he made the information revolution not only accessible, but intuitive and fun. And by turning his talents to storytelling, he has brought joy to millions of children and grownups alike. Steve was fond of saying that he lived every day like it was his last. Because he did, he transformed our lives, redefined entire industries, and achieved one of the rarest feats in human history: He changed the way each of us sees the world. The overwhelming outcry of sadness, wrapped in accolades, for Jobs also flooded the Twittersphere. Michael Dell, founder of Dell Inc.
@MichaelDell Today the world lost a visionary leader, the technology industry lost an iconic legend and I lost a friend and fellow founder. The legacy of Steve Jobs will be remembered for generations to come. My thoughts and prayers go out to his family and to the Apple team. @richardbranson RIP Steve Jobs. A truly great businessman. Inspiration to so many. A real Family man. He will be sorely missed. @benkaufman "Those who are crazy enough to think they can change the world, are the ones who do.". Thanks Steve. Your products started me on this path. @gchahal Thank You, Steve Jobs. @aplusk We have all surfed on the wake of Steve Jobs ship. Now we must learn to sail, but we will never forget our skipper. Stan Ley: For changing all of our lives, for always seeking a great way to connect people together, for being one of the top 10 visionaries of all times. Dawayne Montgomery: Creativity, desire and a brilliant view of the future. Jerry Tung Perfectionism: That strong, unwavering vision when it came to products and presentations and his inspiring speech at Stanford. Martha Puff Sheard: For being an inspiration to entrepreneurs. Respect due for not being afraid to take risks -- what entrepreneurship is all about. RIP, indeed. K Scott Burgess: His comeback after being fired at Apple; Macintosh commercial, the first time I saw an iPod, his quote "Stay hungry, stay foolish." James Thomson: I'm not a huge Apple guy but Steve Jobs was a giant. His innovation and commitment to excellence has been and will continue to be an inspiration to entrepreneurs for years to come. There aren't many like him and there will be few to follow. Tina Rucker Clemmons: So young. But accomplished more in 56 years than I could imagine in my current 42 years. He's certainly inspirational. Bryan Bmon Adams: Everything. It would take hours to write. The single biggest influence for me. What are your reflections on the life and work of Apple's Steve Jobs? Leave your comments below. You can also share your thoughts, memories and condolences by emailing Apple.